The word Bhima in Sanskrit means, “terrible” or “formidable”. Bhima is a character from Epic Mahabharata who went to 12 years of exile along with his brothers after losing their kingdom in a gamble with Kauravas and Shakuni. Son of Pandu, Bhima like other Pandavas had an abnormal birth because of curse on his parents. He was born after his mother Queen Kunti invoked God of wind, Bayu. While he is primarily referred as Bhima in Hindu Epic Mahabharata, people also often substitute his name for “Bhimsen”. He carries various other names like Vikrodhara, Gadadhara, Ballava, etc. He is second in line amongst his 5 brothers i.e. 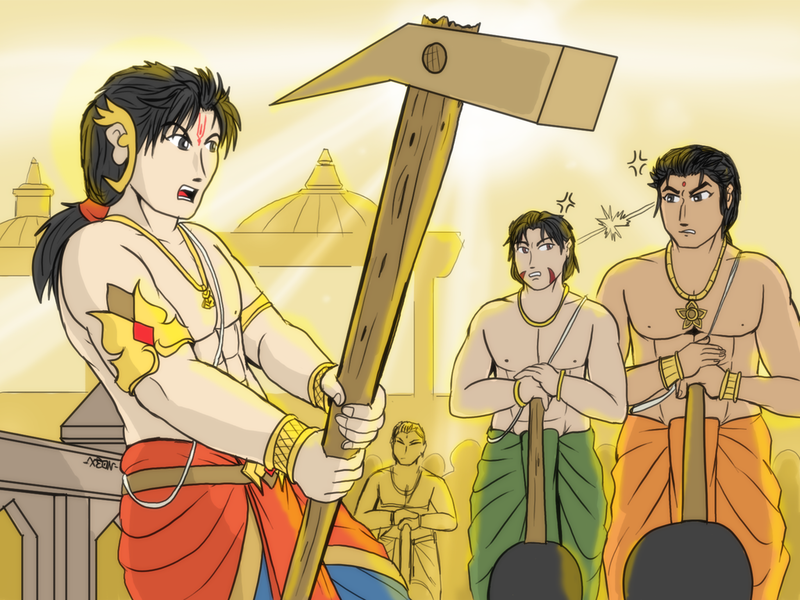 Pandavas. Bhima carries his name as a formidable deity for accounts of his might in Battles. He is revered as a prominent deity for his role in the Hindu Epic Mahabharat, as he was responsible for slaying all hundred Kauravas including “Duryodhana”. Bhima has a huge number of Hindu and Buddhist followers who pay respect to him. Hindus and Buddhists alike pay him respect for his strength, valor, and his willingness to fight against falsehood. Like, every other Pandava who are associated with five aspects of “Shiva”, he is connected to a wrathful form of Bhairava. As per legends, he is especially known for his towering strength because even Lord Indra couldn’t subdue his wrath in battle. Similarly, he is also revered for his excellence in the use of “Mace” or “Gadha” in battles, which led to the acquisition of title, “Gadhadhara”. He was second only to Duryodhana in mace fighting skill who were both the disciples of Lord Balaram. He was the often handed role of commander in battles thanks to his ability to win wars. Apart from his strength Bhima is also well renowned as “Vrikodara” due to an enormous appetite. Legends say his diet consisted of half of the food prepared for Pandavas. Similarly, he is also known for giving up his kingdom Indraprastha and going to pilgrimage in the Himalayas along with other Pandavas. Unlike, his brothers who either married once or twice, Bhim was married thrice. He was a father to Ghatotkach’s mother “Hidimba”, a princess from Rakshas family. His second marriage was with Drupad princess, “Draupadi” whom he married along with his four brothers. He fathered Sutasoma as his son from Draupadi. His third wife “Valandhara” was Daughter of Kasi’s King, he later had a son named “Sarvada”. His sons Ghatotkach and Sutasoma also played key roles in the war of Mahabharata. He had numerous achievements throughout his lifetime. One of his most notable achievement was an escape from the fire of Lakshagraha palace. He saved his family by carrying them single-handedly and also managed to kill the plot maker Purochana, who had set the palace on fire. Similarly, he freed villagers of Ekachakara from misdeed and evil of Bakasura by slaying him, while they were in agnyatavaasa (hidden stay after murder plot). Likewise, he is also known for the death of Duryodhana in the final battle of the Mahabharata, where he earned the title of “Crooked Warrior”, after striking Duryodhana with mace below the waist, which was against the rules. In the end of his life, while ascending to heavens, Bhima was unable to make the journey along with brothers after a fall. Subsequent to his fall, Bhima questions his eldest brother Yudhisthira, why he who had enormous strength couldn’t get back up. Upon hearing the question from him, Yudhisthira answered that his lust for battle, gluttony, pride/boastfulness which arose from his strength were the reasons for the inability to stand up. While his strength leads to these negative aspects in last moments, it was again his strength and fearlessness which prevailed justice in the epic of Mahabharata.